Mizoram governor Kummanam Rajasekharan on Saturday addressed a virtually empty ground at Aizawl on the 70th Republic Day, due to a statewide Republic Day boycott call given by an umbrella organisation of NGOs in protest against the Citizenship (Amendment) Bill, 2016. No member from the public was seen in the Republic Day celebration responding to the boycott call given by NGO Coordination Committee, an organisation of civil society groups and student bodies, in protest against the Citizenship (Amendment) Bill, which has already been passed in the Lok Sabha. Programmes were boycotted in the state capital as well as district headquarters where the deputy commissioners were only permitted to hoist flags amidst small gatherings in the office grounds. The only group that was permitted to join the celebration in the state capital was that of VIPS including the Mizoram chief minister, ministers, state secretaries, armed contingents, MPs, MLAs and award recipients among others. 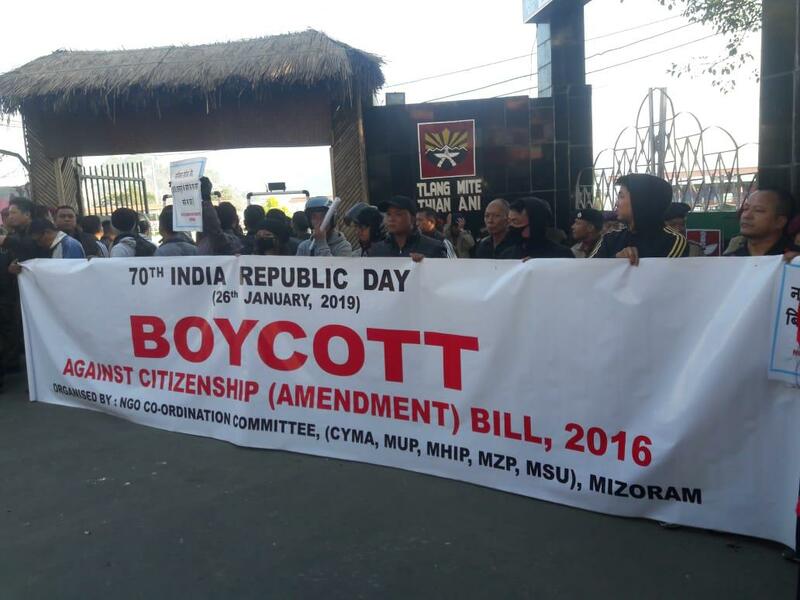 There were many volunteers of different NGOs who staged protests near the ground with placards displaying statements such as ‘We do not need illegal immigrants in Mizoram’. A public rally was convened on January 23 by Mizo Zirlai Pawl (MZP), a students’ organization, in against the Bill where MZP president Ramdinliana Renthlei announced they are ready to fight for independence if the Central government passes the Bill. There were 9 contingents (six armed contingents and three band parties) at the Republic Day parade, who were led by parade commander, DSP C Lalsawta and 2nd parade commander DSP Lalpianthanga. Only six armed contingents participated in the Republic Day parade while usually up to 30 contingents traditionally participate in the annual event, said officials. The Republic Day celebrations, however, passed off peacefully in the state without any untoward incident, despite the presence of placards carrying protesters near the venues. On his Republic Day address, the Governor assured the people that stringent measures will be taken to protect the state borders. He said measures will be taken for execution of Mizoram Village Level Citizen Registration. The Governor also said the government is committed to preserve and promote Mizo identity, tradition and values and that it will endeavour to work for the unity and brotherhood of all Mizo people living within India and across the globe within the constitutional framework. While the NGOs had planned to carry out a total boycott, the CM and state ministers had negotiated with the Joint NGO Co-ordination Committee where the both the sides came to an agreement to allow VIPs and award recipients to take part in the Republic Day celebration.. The governor also said Mizoram would introduce the Socio-Economic Development Policy (SEDP), a “holistic inclusive development programme aimed at bringing in socio- economic transformation”. The Mizoram governor also hinted at prohibition on liquor in the state. “In keeping with our election manifesto, necessary measures will be taken to repeal the Mizoram Liquor (Prohibition and and Control) Act, 2014,” said the governor.